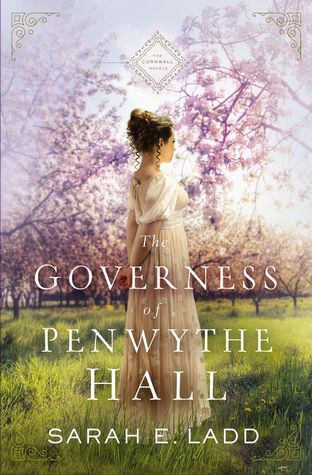 The Governess of Penwythe Hall by Sarah E. Ladd is the first book in a brand new Regency romance series, The Cornwall Novels. Thanks to NetGalley for providing me with an advanced e-copy of the book. This post contains affiliate links. Books that are set in the Regency period are some of my favorites, and this is no exception. From the very beginning, The Governess of Penwythe Hall draws you in. You wonder what has happened that Cordelia is leaving her mother-in-law’s home, and why her mother-in-law is so angry. And, you don’t find out until much later in the book what happened! A few years pass, and the book picks up with Cordelia having been a governess, during those years, to 5 children she loves as much as she’d love her own. Sadly the children lost their mother years ago, and then they lose their father to a tragic accident. At the very last moment, their father changes his will and names his brother as the children’s guardian, rather than his wife’s sister. This comes as a complete shock to his brother, Jac, since they hadn’t been on speaking terms for years. It’s also a shock when the children, along with their governess and tutor, show up since the letter “warning him” never arrived. I loved the development of the characters through the story, especially that of the eldest child. The romance that develops in the book is very believable and not rushed like some love at first sight books are. Sarah E. Ladd uses such descriptive language, that you almost feel as if you are in Cornwall in the 1800s. Once the story takes us back to this area, we start finding out more about Cordelia’s past and why she left her mother-in-law’s house. I absolutely love the how everything plays out in The Governess of Penwythe Hall. If you are a fan of inspirational historical fiction, you will too! Add this book to your Goodreads shelves! Purchase The Governess of Penwythe Hall on Amazon.